What’s Your Best Case Scenario? What if “it” all worked out better than you ever imagined? Can you consider that possibility? Many cannot. We live in a fear-driven culture. If you don’t believe that, just watch the news and ads on TV. Either something terrible just occurred or something terrible could occur if you don’t take this supplement, buy that insurance, watch your diet, purchase that exercise program, hire this attorney, etc. We are conditioned to plan for the worst. And that keeps us safe. Or does it? I’m in the business of helping others achieve their big goals and that involves taking risks. Planning for a worst case scenario is important, but so is planning for the best case scenario. The problem with always focusing on a fear- driven plan is that it can prevent you from growing and inadvertently keep you small. I encourage all of my clients and myself to also consider the best case scenario. If you can see it, you can make it happen. And, if you can’t see it, it will never happen. This I learned from working with horses. If you’re not clear about what you want, you may get tossed to the ground. I know, I’ve been there with horses and in business. Here are five questions to help you position to achieve your best. What is your best case scenario? Feel how easy or difficult it is to answer this question. Does your mind keep going back to “yes, but…?” That’s fine and normal and indicates that you may want to spend a bit more time seeing the good, imagining the best and allowing yourself to dream. What if I said “yes” to the best case scenario? Did your heart just skip a beat? Did you suddenly feel nervous? Check in with your heart and gut. Your body is giving you information. How does pondering this question feel? Does it excite you, terrify you, excite and terrify you? That’s good. Your internal guidance system is waking up to possibilities. You’re beginning to use your entire being as a sensor. What would need to shift if I said “yes” to the best case scenario? Here’s where your rational mind can jump back in. It can help you make a plan. What resources would I need to make the best case scenario a reality? Yes, most everyone could use a bit more time and money, but here’s where you begin drilling down to the details. What specifically do you need – strategic networking, more training, a new website, a new hire, subcontractor support, a dog walker, a housecleaner, a coach? What is the smallest baby step that I could take now to begin to make the best case scenario a reality? Take that tiny step to build confidence and courage. Allow the best case scenario to emerge organically without force one step at a time. 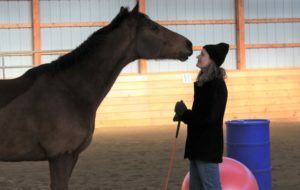 This is how I work with entrepreneurs and horses. I guarantee that amazing things can happen if you’re consistently persistent with taking tiny baby steps over time. Most of all, enjoy the journey. Explore, experiment and discover. Give yourself some grace. One thing I know for sure, you can always reinvent yourself. My new ex-racehorse Lemon Squeezy is reinventing himself for a new career – if you’d like, join us and witness his transformation in our new program, Reinvention in the Round. Good luck! Terrific leadership advice. And I also notice that it’s how you live your one precious life!